Charlo’s Vaness Kent connects with the ball on the way to a second place finish. 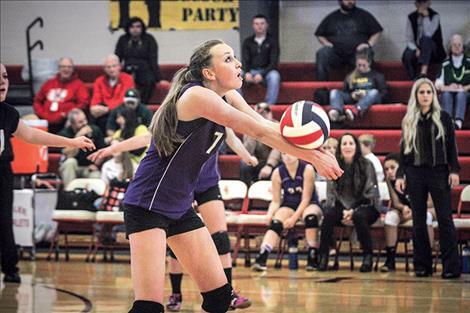 Mikayla Rieken works through set after set to earn first place in the 14C district tourney. 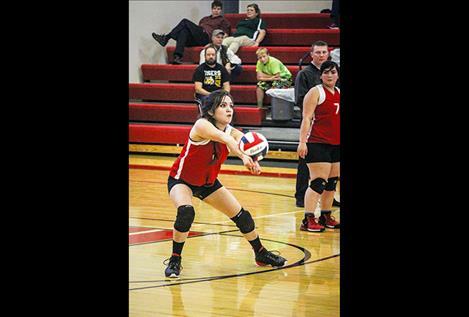 ARLEE — Cross-county rivals battled it out for first place in District 14 throughout Friday and Saturday’s tournament. 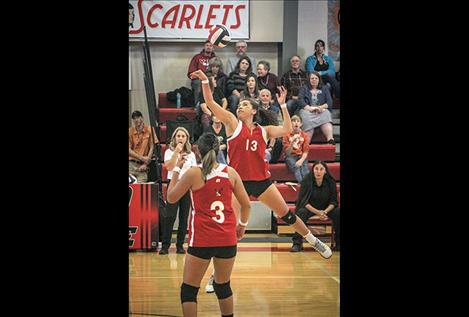 With schools only 30 miles apart, the Arlee Scarlets and the Charlo Lady Vikings couldn’t have been closer on the court as they fought through six matches. The Scarlets took the grand prize after two Championship matches and the Lady Vikings sailed home with silver. To get there, Charlo defeated Hot Springs on Friday in a very close five games. Cheyenne Nagy and Allie Delaney led the defense with 40 digs each. Nagy also had an astonishing 20 kills on the night. Brooklyn Faust had three blocks and Allie Delaney had three aces on the night. Charlo then went on to defeat Arlee in the second round in three games. Allie Delany had 26 digs, Tomi Brazill had 12 assists, and Cheyenne Nagy had 11 kills. After losing to Charlo in the first round, Arlee then defeated Two Eagle in a quick three games. Tomi Brazilll had 14 of the 17 assists on the night. Carly Hergett had six kills and Mikayla Rieken and Ashley Tanner each had five aces. Two Eagle lost to Hot Springs in the next loser-out match. In the last game of the first round, Charlo knocked Arlee to the loser bracket in three games, forcing the Scarlets to take the detour to the top in loser-out games. Lady Vikings Allie Delaney had 26 digs and Cheyenne Nagy had 11 kills. Scarlets Tomi Brazill helped with 12 of the teams 22 assists, Bryndle Goyin smacked 8 kills and Edin Morin had 12 digs. 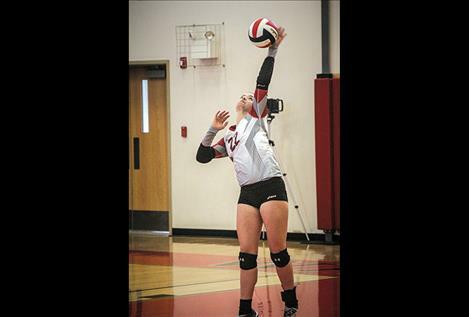 The morning dawned brighter for the Scarlets as Arlee plowed through Noxon and Plains in three sets each, sending the Lady Red Devils home and the Trotters to fourth place. 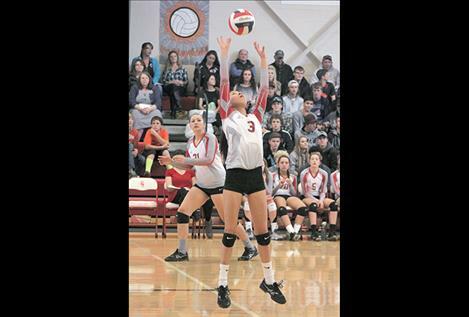 Charlo tallied 122 digs and Cheyenne Nagy scored 19 kills as they displaced St. Regis on Saturday in four close sets, sending the Lady Tigers off to the Scarlets for the third-place contest. Arlee made short work of St. Regis in four sets to advance to the championship rounds with Charlo. Bryndle Goyins led the Scarlets with 14 digs and 14 kills while Abby Yocum slammed six aces. Clearly on a roll, Arlee battled Charlo for the top spot in the championship match, beating them in just three sets. But because Charlo had already earned a win against Arlee, the teams went to a tie breaker match. Charlo took the first set 25-17, but Arlee answered with a close 22- 25 win. Set three went quickly as Arlee trounced the Lady Vikings 14- 25, but Charlo rallied to a 25-15 set win to set up the fifth and final set in the marathon weekend. After 24 total sets played in the tournament, a tiny 5-point difference was all it took to rise to the top for Arlee in the final 10-15 set and claim the title. Both teams advance to the Class C Divisional tournament this coming Thursday-Saturday, Nov. 3-5, in Butte. Starting on Thursday, Charlo plays Gardiner at 10 a.m. and Arlee challenges Lone Peak at 2:30 p.m. The top two teams at Divisionals will advance to state. Digs Charlo 140 (Cheyenne Nagy 40, Allie Delaney 40), Hot Springs 124 (Stacy Gracy 23, Sophie Jefferies 23). Assists Charlo 37 (Teaira Truman 31), Hot Springs 25 (Karly Lawson 18). Blocks Charlo 8 (Brooklyn Foust 3), Hot Springs 10 (Karly Lawson 5). Kills Charlo 46 (Cheyenne Nagy 20), Hot Springs 32 (Lexie DeTienne 8). Aces Charlo 8 (Allie Delaney 3), Hot Springs 5 (Karly Lawson 2, Jessica Heppler 2). Digs Charlo 72 (Allie Delaney 26), Arlee 41 (Eden Morin 12). Assists Charlo 17 (Teaira Truman 13), Arlee 22 (Tomi Brazill 12). Blocks Charlo 3 (Sakoya Gustad 2), Arlee 3. Kills Charlo 21 (Cheyenne Nagy 11), Arlee 23 (Bryndle Goyins 8). Aces Charlo 10 (Destiny Manuel 3), Arlee 3. Assists Arlee 17 (Tamie Brazilll 14). 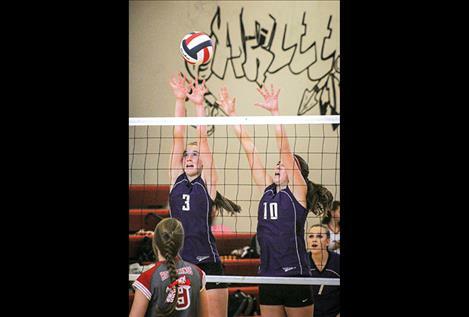 Blocks Arlee 1 (Carley Hergett 1). Kills 20 (Carley Hergett 6). Aces Arlee 18 (Mikayla Tieker 5, Ashely Tanner 5). No individual stats were given for Two Eagle. Digs Charlo 122 (Allie Delaney 44), St. Regis 91 (Justice Tate 19, Emma Hill 19). Assists Charlo 27 (Teaira Truman 27), St Regis 33 (Anna Sanford 27). Blocks Charlo 15 (Sakoya Gaustad 7), St. Regis 5 (Courtney Cheesman 3). Kills Charlo 35 (Cheyenne Nagy 19), St. Regis 39 (Courtney Cheesman 21). Aces Charlo 20 (Kaitlin Cox 9), St. Regis 7 (Courtney Chessman 2, Justine Tate 2, Emma Hill 2). Digs Arlee 49 (Eden Morin 15), Plains 53 (Lindsay Laws 15). Assists Arlee 23 (Tomi Brazill 14), Plains 25 (Kristen Josephson 15). Blocks Arlee 3, Plains 8 (Rachel Huerink 5). Kills Arlee 25 (Bryndle Goyins 11), Plains 20 (Hailey Coe 6, Kara Altmiller 5). Aces Arlee 15 (Carley Hergett 7), Plains 9 (Jessica Thompson 3). Digs Arlee 61 (Bryndle Goyins 14), St. Regis 78 (Madison Hill 18). Assists Arlee 32 (Ashley Tanner 14), St. Regis 20 (Madison Hill 8, Anna Sanford 8). Blocks Arlee 6 (Carley Hergett 4), St. Regis 8 (Courtney Cheesman 2, Anna Sanford 2, Justice Tate 2). Kills Arlee 38 (Bryndle Goyins 14), St. Regis 30 (Courtney Cheesman 8, Justice Tate 8, Madison Hill 8). Aces Arlee 12 (Abby Yocum 6), St. Regis 6 (Madison Hill 2, Courtney Cheesman 2). Digs Arlee 91 (Bryndle Goyins 20). Assists Arlee 29 (Tomi Brazill 14). Blocks Arlee 5 (Carley Hergett 2, Abby Yocum 2). Kills Arlee 38 (Bryndle Goyins 11). Digs Arlee 99 (Eden Morin 30). Assists Arlee 34 (Tomi Brazilll 17). Blocks Arlee 10 (Carly Hergett 5). Kills Arlee 47 (Bryndle Goyins 18). Aces Arlee 6 (Carley Hergett 2, Mikayla Rieken 2).